Korda Stow Complete Indicator These are ready-to-go indicator systems that are available in all six colours. You get a head with weight, magnetic hockey stick and TWO chains. The reason that the kits are supplied with two chains is so that you can use your indicators with any type of conventional bite alarm. The chains with short steel extensions are suitable for Delkim-sized alarms, whereas the chains with long extensions are for smaller, Neville-type alarms. These kits represent real value for money because they contain everything apart from isotopes, which are available separately. The only question is, which colour will you go for?? 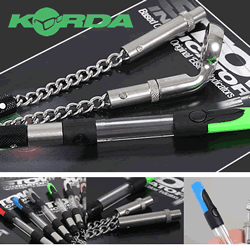 Looking to buy some Korda as part of a fishing gift? If you would like some advice on purchasing Korda, simply contact our expert fishing team, giving us either an email or phone number on which to contact you and we'll get back to you right away with the best advice and prices. FREE Delivery on all Korda Korda over £100!! !